Of course, I go through a personal life transformation in the play where my character’s persona changes as the events of time are altered. My wife Lorraine accidentally sets off one of Doc Brown’s experimental time-vortex coffee machines he had left in the care of Marty and Jennifer. In our play, my change was no fault of my own. It was much different, however, in Back to the Future, Part I. In the year 1985, George’s life is a mess. His character is a spineless, nerdy wimp of a man who has succeeded at little in life. George shows no emotional connection with his wife Lorraine or his three children, and his supervisor at work, Biff Tannen, easily intimidates him. 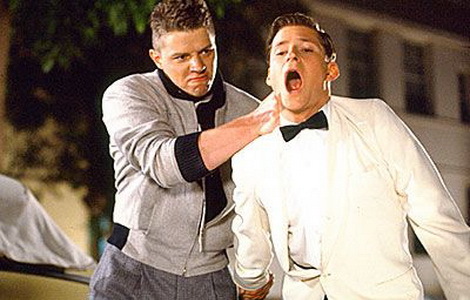 In fact, as the movie progresses back in time to 1955, we learn that Biff has been bullying George since high school. Biff only passed high school and advances through life by forcing George into doing all his work for him. Yes, George lacks courage but he loves science fiction. In fact, in high school he is writing a novel about space aliens coming to earth from other planets. So he has imagination, creativity and initiative to begin projects but no belief his life has value. He has no confidence in his ability to accomplish anything. How could he? Life had literally beaten him up. Until one night when Darth Vader from the planet Vulcan shows up in George’s bedroom and, through his walk-man headphones, blares Van Halen into George’s ears as he sleeps. (This is actually George’s son Marty who has gone back in time and is in disguise.) He commands George to take Lorraine to the “Enchantment Under the Sea” dance. If he doesn’t then Darth would melt his brain. Incentive enough, especially for a science fiction nut. With that swing, George changed his life. He knocked out the bully. He confronted himself and wiped away years of pain. I’ve written previously about the “I’ve Had It Moment” we all face at some point in our life. It’s a moment of stress and pain, but it is also a moment of courage when we stand our ground against a struggle and say, “That’s enough! No more! I’m going to do whatever it takes to change.” George faced that moment and his action changed his family tree. So, what’s the take away for us? Is there a financial hurdle you need to address so future generations of your family will experience prosperity? Is there a work related problem that has you crippled, unable to move forward? Is there a family issue you can resolve that might help break a generational trend of alcoholism, abuse, or poverty? Is there a spiritual struggle keeping you from experiencing the joy of an abundant life? What’s the bully in your life you need to stare down and take a swing at? ill be sure to come see the play!!!!!!!!!!!!!!!!!!!!!!!!!!!!!!!!!! Thanks! Be forewarned…You may have a whole different perception of me by the time the play is over.